nystudio107 | Craft CMS 3 Orientation Guide - Welcome! With the release of Craft CMS 3, the plat­form has been grow­ing in pop­u­lar­i­ty of late, so we have many peo­ple who are new to the plat­form enter­ing the community. This arti­cle is meant to be an ori­en­ta­tion guide, to help you under­stand what Craft is, how you might use it, and grok the over­all par­a­digms that Craft uses. Whether you’re just com­ing to Craft your­self, or you’re on-board­ing a devel­op­er who is new to Craft, or you’re just sur­vey­ing the land­scape to see what’s out there, this is the blog for you. In the spir­it of ​“teach­ing some­one how to fish,” we’ll also pro­vide a list of resources where you can get help, and learn more about Craft! Link What is Craft CMS? Craft CMS 3 is a con­tent man­age­ment sys­tem cre­at­ed by Pix­el & Ton­ic that is designed for peo­ple who want some­thing a lit­tle bit more out of the sys­tem. It fol­lows the tra­di­tion­al mod­el of an AdminCP back­end for con­tent author­ing, and serv­er-side ren­dered con­tent for the frontend. Craft uses PHP (7.0 or lat­er required) as the base lan­guage, with the robust Yii2 frame­work lay­ered on top. Craft itself is then lay­ered on top of that, pro­vid­ing the con­tent mod­el­ing, AdminCP inter­face, and a bevy of APIs to let you manip­u­late user-gen­er­at­ed content. It uses the Twig tem­plat­ing lan­guage for inter­fac­ing with its APIs and ren­der­ing con­tent, but it also can work as a ​“head­less” con­tent serv­er via the Ele­ment API or GraphQL via the CraftQL plu­g­in. So you can use Craft to ren­der your con­tent via HTML/​Twig, or you can use it for the con­tent author­ing, and ren­der your fron­tend with Vue­JS or React or what­ev­er you prefer. Unlike many API-based CMSs, Craft is self-host­ed, so there are no month­ly or usage fees. See the arti­cle How Agen­cies & Free­lancers Should Do Web Host­ing for more infor­ma­tion on self-hosting. Where Craft dif­fers from oth­er such CMS sys­tems is in its rich con­tent author­ing sys­tem on the back­end, as well as a fron­tend that’s essen­tial­ly a blank canvas. Craft’s lack of assump­tions is some­thing that can be off-putting to peo­ple who are approach­ing it for the first time. There is no con­cept of ​“pages” or ​“posts” or the like. Why not? Because if those were the base build­ing blocks for the CMS, it’d be mak­ing some pret­ty bold assump­tions about how the web­site is structured. There are also no ​“themes.” The fron­tend is yours; Craft doesn’t inject any­thing into it like a CSS theme. Instead, you can use what­ev­er CSS frame­work you pre­fer (or your own) to cre­ate some­thing cus­tom, indi­vid­ual, and awe­some. One frame­work that is grow­ing in pop­u­lar­i­ty is Tail­wind CSS, as dis­cussed in the dev​Mode​.fm episode Tail­wind CSS util­i­ty-first CSS with Adam Wathan. When a page is loaded on the fron­tend, Craft finds the Twig tem­plate that match­es the URI, and ren­ders it with data inject­ed from the cor­re­spond­ing Entry. With these build­ing blocks and their abil­i­ties, you can design what­ev­er infor­ma­tion archi­tec­ture that is need­ed for your web­site. There are of course more avail­able, such as tags, per­mis­sions, and so on, but these are the basics that you should con­cep­tu­al­ly be aware of. Craft also has robust local­iza­tion, mul­ti-lin­gual and mul­ti-site sup­port built into the foun­da­tion of the system. There’s also a Live Pre­view for con­tent authors, a robust plu­g­in ecosys­tem (with an inte­grat­ed plu­g­in store), and a pow­er­ful debugger/​profiler to help speed the devel­op­ment of your project. You can even make a full blown cus­tom appli­ca­tion as dis­cussed in the Enhanc­ing a Craft CMS 3 Web­site with a Cus­tom Mod­ule article. There’s an old expres­sion: ​“Use the right tool for the job.” The rea­son this is such an endur­ing con­cept is that it applies to every­thing from car­pen­try to writ­ing to choos­ing a Con­tent Man­age­ment Sys­tem (CMS). Craft is no exception. In the recent inter­view Craft CMS 3 with Pix­el & Ton­ic Founder Bran­don Kel­ly! on dev​Mode​.fm, the CEO of Pix­el & Ton­ic him­self stat­ed that for friends of his who need­ed a sim­ple web­site, he’s nev­er once rec­om­mend­ed Craft CMS. 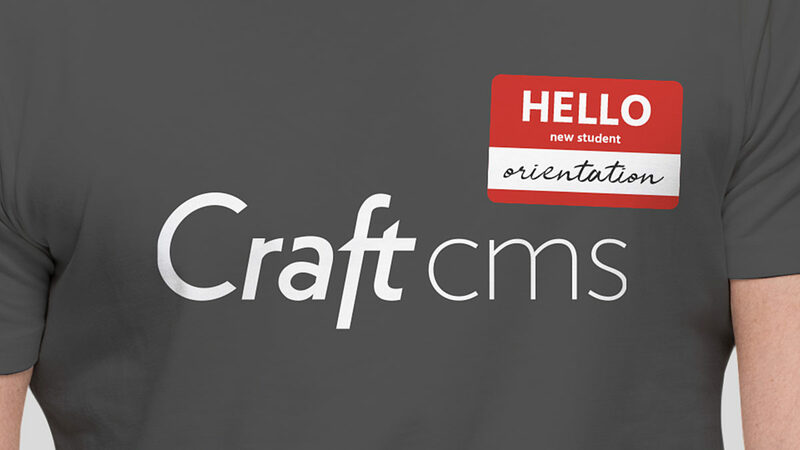 Craft CMS has been used to cre­ate every­thing from celebri­ty web­sites to full eCom­merce stores (using Craft Com­merce) to cus­tom intranet portholes. You can use it to cre­ate a tra­di­tion­al web­site, or you can also lever­age the robust Yii2 frame­work to cre­ate a cus­tom appli­ca­tion that needs a friend­ly back­end for con­tent authors. …and many more. Check out the Craft CMS Case Stud­ies for more in-depth dis­cus­sion how Craft has been used to solve real-world problems. Link Where do I go from here? This arti­cle is just your ori­en­ta­tion; now it’s time to dive in, and get start­ed with Craft CMS. This is where we teach you how to fish. Awe­some Craft. Care­ful­ly curat­ed list of awe­some Craft CMS arti­cles, resources and shiny things. The Set­ting up a New Craft CMS 3 Project arti­cle goes into more depth on actu­al­ly set­ting up a new Craft project, if you’re itch­ing to get going. The Craft Mind­set is an excel­lent and FREE video series from CraftQuest​.io to help you approach a Craft project with confidence. Now go out and and cre­ate some­thing fantastic!